This is the fifth in a series of articles entitled “Which Scales Go with Which Chords?” covering the Dominate 7 Chords. When improvising, it’s important to know which scale(s) to use. Traditional Harmony usually has one scale for the entire song (or section). When the song modulates (changes key), the scales used are also changed. Besides the standard Dominate 7 (1 ▪ 3 ▪ 5 ▪ ♭7), there are two other versions of dominate chords that behave similarly. (We’ll discuss “why” later). 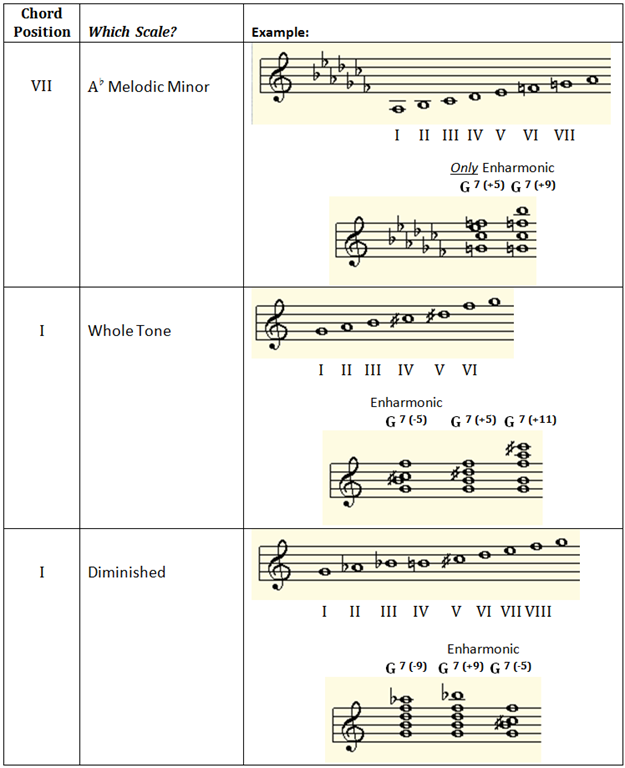 In Traditional Harmony there are no scales that include the Dominate 7 (-5) or Dominate 7 (+5) – however Jazz Theory allows the use of enharmonics to create equivalent chords. 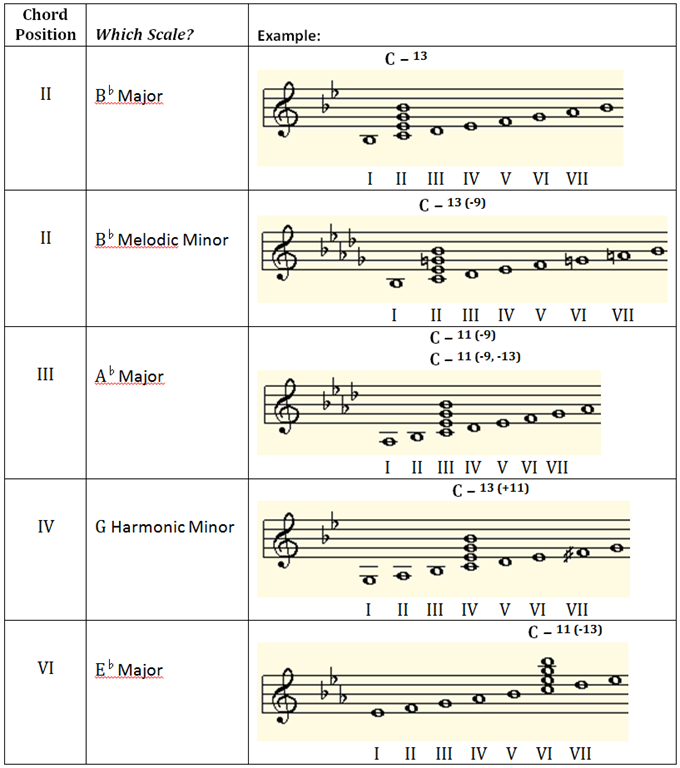 Major and minor chords can choose more freely when selecting scales for improvisation. However, Traditional Harmony is “correct”; dominate chords are closely tied to the NEXT chord(s) in their chord progression. Choose a scale with a close relationship to the subsequent chords in your progression. 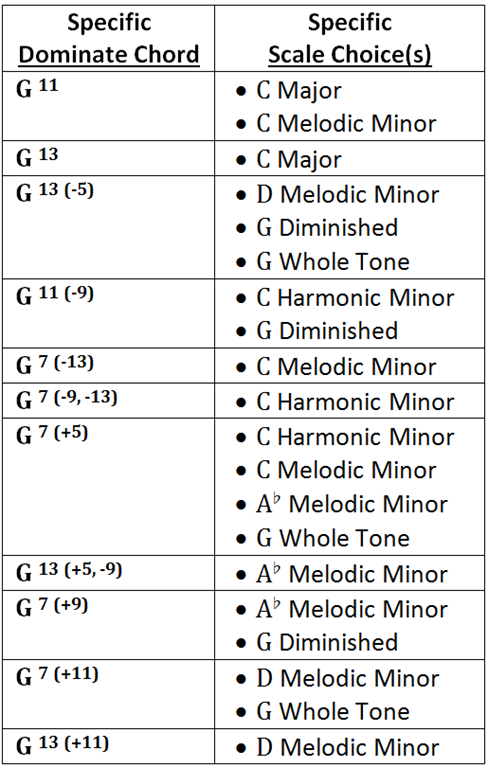 SPECIFIC CHOICES: While all of the (above) scales can be used with a standard Dominate 7 chord, your scale choices become specific when adding alterations and extensions. 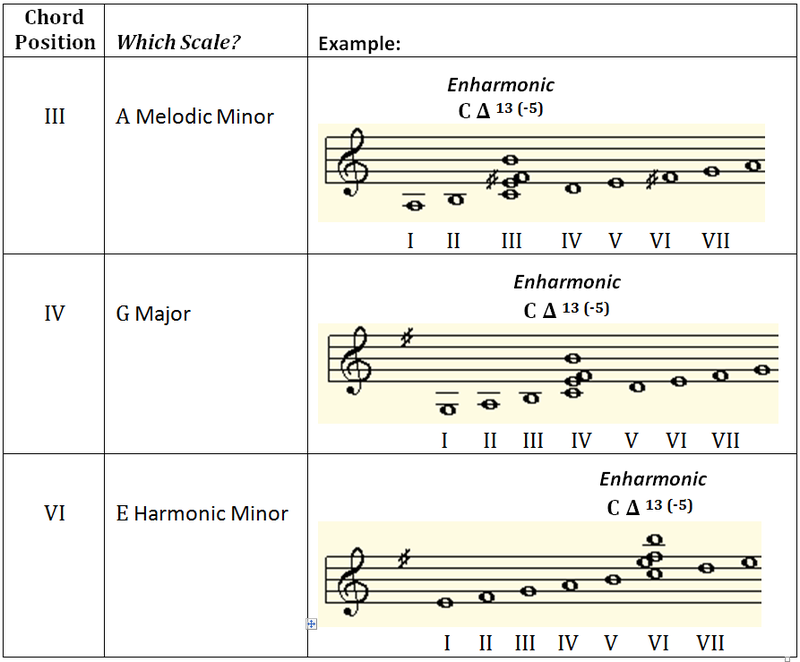 This is the fourth in a series of articles entitled “Which Scales Go with Which Chords?” covering the Minor ∆7 Chords. 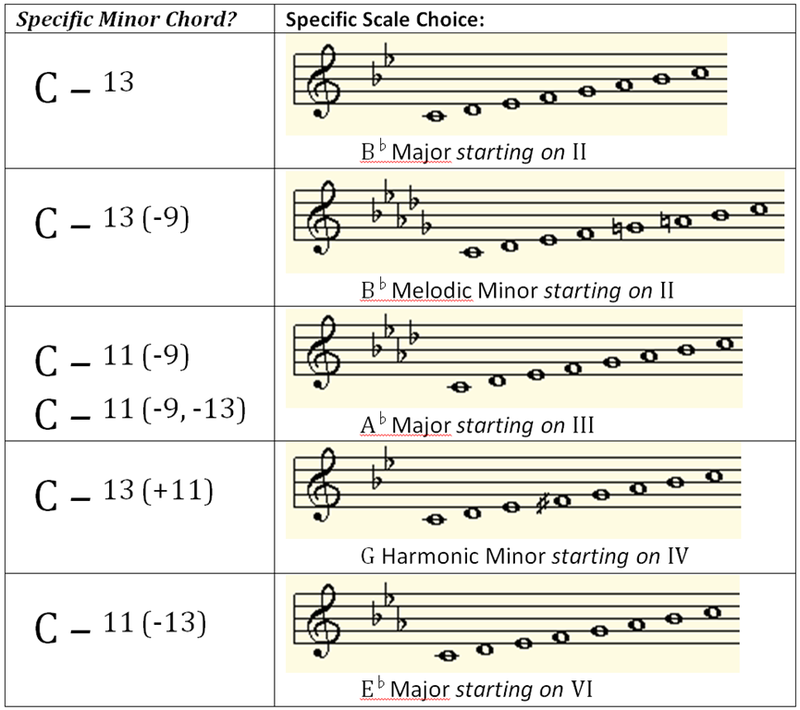 ONLY TWO SCALES: Because there are only two (2) scale choices, your selection is based upon using the major versus minor 13th. USE YOUR EAR! Regardless of “proper key” – do you like the sound of the major or minor 13th?. 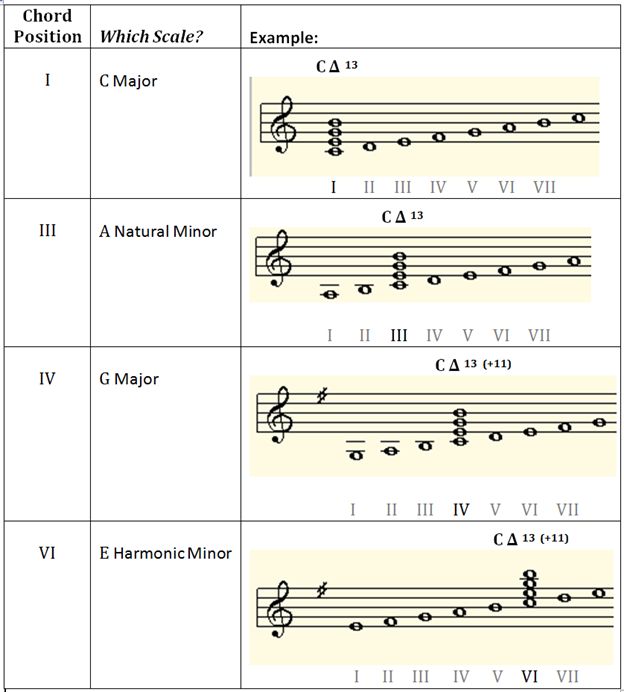 This is the third in a series of articles entitled “Which Scales Go with Which Chords?” covering the Minor 7 Chords. FIVE? 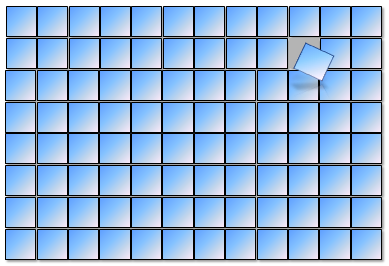 SCALE CHOICES: While there are five (5) scales listed, you can quickly narrow your scale choices. Minor 7th with standard 9th? Only three (3) scale choices. Minor 7th with diminished 9th? Only two (2) scale choices. 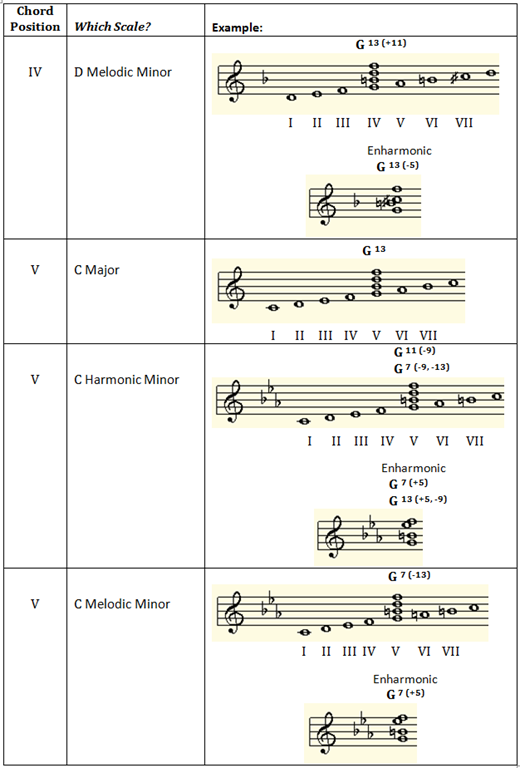 SPECIFIC SCALE CHOICES: Each scale has specific minor chord attributes. USE YOUR EAR! Regardless of “proper key” – do you like the sound of the altered notes from a different scale?